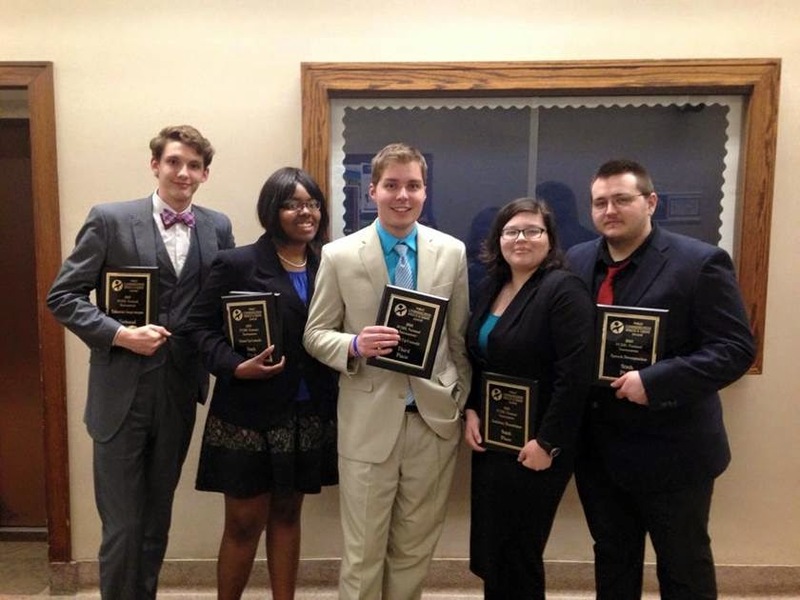 The UIS Forensics Team finished the 2014-2015 season strong, bringing home many awards and recognitions from the PCSDL National Tournament in Indianapolis on March 28-29. Freshman Simon Andrews was awarded National Champion in Editorial Impromptu, 2nd place in Current Events Speaking and 5th place speaker in Student-Congress. Team captain and senior Bob Gibbons was awarded 3rd place speaker in Student-Congress, 3rd place in Stand-Up Comedy and 5th place in PowerPoint Sales. Junior Jerica Griffin won 6th place in PowerPoint Sales and 6th place in Stand-Up Comedy. Junior Tabbitha Medina won 6th place in Audition Monologue. The team took 6th place overall in the competition. The team has had an outstanding season winning a total of 41 awards, the largest number earned since the team was re-established in 2011.